UPDATE: I have read many comments people asking about delivery time, delivery time is 30-60 days for Pakistan. Don’t worry and keep waiting. If you report them and they send new card to you then previous card will be disabled in your account, means you can no longer use if it arrives after days. Very useful tip bout address: Please see “Address Information” on how to enter your address. I saw many people asking and searching “how to get free Debit card” to use for on-line services and withdrawing money.I thought to write an article about complete guide how to get Master card and use it online. Payoneer is an international company founded in 2005, which offer free master debit card to anyone linked with their partners.It is providing its services in more than 210 countries. 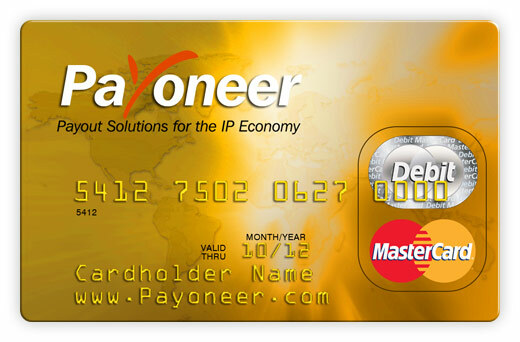 Payoneer card is a physical card same as credit card, but it is pre-paid debit card powered by MasterCard. Prepaid means it can only be used when it has money in it. So, you should first load money in account before using it anywhere.You can use it online for buying on internet, withdrawing money from ATM machines or paying on any POS which accept major credit cards. It can also be used to verify your Paypal, Moneybookers, Alertpay and eBay accounts. How to Get Payoneer Card? You can get payoneer card by applying from any of the following companies you work with. Here is the short list. Don’t use any partner site?Still you can get payoneer card. After completing the form you have to wait for approval of your debit card request and after that they will ship card to your address. Note: Always use your name and mailing address correctly, Otherwise Payoneer will not responsible for card lost. While applying for Payoneer card, in address field please enter your complete address including country name i.e Pakistan. I have demonstrated in picture below. One approved they will ship and you will get it within 15 days (Max 30days) at your home address. How to Activate Payoneer Card? 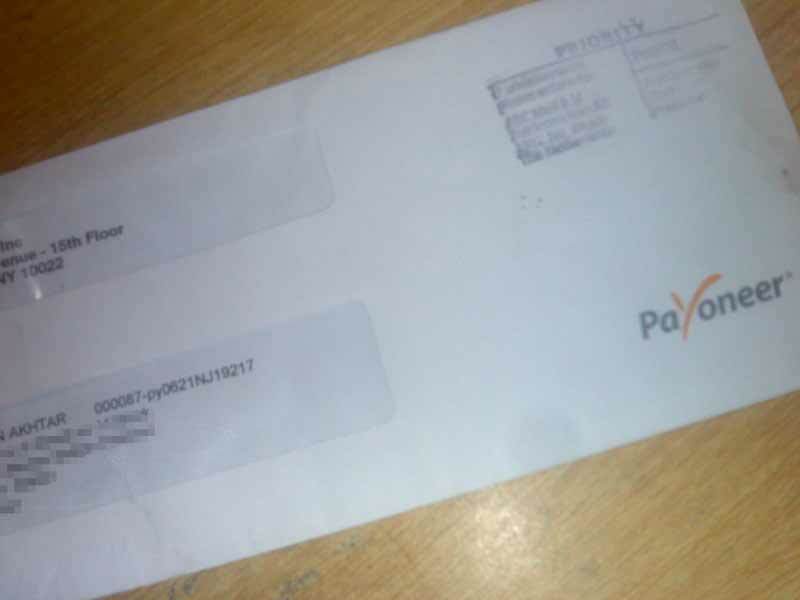 After receiving it go to website www.payoneer.com and click on Activate your card and after login type card number and PIN code twice to activate it. Here is the demo video by Payoneer on how to activate payoneer card. Payoneer charges varies partner to partner but if you apply by their affiliate website the charges will be as follows. In Pakistan following bank’s ATMs support Payoneer Master card. You can find ATMs of these banks within your city by using MasterCard ATM locator. MCB ATM charge 200/transaction and Payoneer charge $3.00/transaction + small currency conversion charges. Payoneer is one of the best company and payment processor I have seen ever.They have affordable fees. I earn, get payment and withdraw it through ATM in seconds. mra card december me expire hojayega, abi tk earning ka koi source ni tha to balance 0.00 tha, ab buhat thori earning horhi to jb me wo payoneer me transfer kronga to 3 year k charges kat jayenge ya rhenge? or card expire hony k bad renew hoga ya replace or usky charges kis trah pay krenge? Ji aap apna name likh dain magar receive koi bhi kar sakta hai. Aap behtar hai English main apna address likhain. Asslam O Alaikum .Bhai jaan mayra card agaya hai . lakin jab main apna card nummber paypal per add kerta ho tu wo massage dayta hai k ap ka card active nahi hai . tu main apna card kasay active kerwaoo . I need help you .. Please see Address Information section of this post. Thanks! kiya hai par mary card application decline hogai hai plz ap bata sakty hai kio Howe hai plz admin help me plz…. No, magar aap credit card ya debit card kay through karwa saktay hain jo internet per acceptable hai. Brother! can you please recommend me couple of sites, where i can do online writing? At oDesk or freelancer you can get writing jobs. hi! mene apke refference par prepaid card signup kya tha.one month mai mujhay airmail ayi mene 11 days k bad verified kya mai mails checkout nai karski thi. they issued my card on 24 dec to 1 jan and i didnt recived .now they said they issued my card ab doobara dhl krne kay woh 65$ lengy.mene contact form mai request di tu they said cardload kroon tu kya shipping fees cover hojayegi? mjhy tu nai deni pareygi i got scared and confused i hope u reply me soon.else i dont have time. Jab aap confirm karogay woh usi waqt DHL kay through send kareingay, aur iskay baray main kuch nae kah saktay woh yeh advance main laingay ya card activation kay baad. Is somevisits is a legal site. ap apne num mujh se rabta kr skty he ??? Aap sabar kijyiee, daidh do maah Pakistan aatey hoey lag jaatay hain. ADNAN BHAI CARD PLHLY PASAY HO GAY TU CARD ACVTIVE HO GA ? Ji janab, pehlay us main about $30 honay chahyieen phir activate hoga. http://www.payoneer.com per ja kar side per Activate Card kay naam say link hai us per click karkay aap card number enter karkay activate kar saktay hain. bhai main ne apply kar dia ha direct kisi k link k bigr to kia card ki fee pay karni paray gi?or agr haan to kesy? Aap kisi bhi partner ko link kar saktay hain apnay card kay saath aur payment receive karnay kay baad fees deduct hojaeygi. hi! mene payoneeer prepaid debit card k liyay abhi apply kiya hai wahan sy approval ayega they ssaid go to your mail upto 3 to 5 min jb mene previous pages dekha tu page crash hogaya 404 error agayay kya meri registration doobara karni hogi.but they said my registration process had complete. Mere pas ager VISA/MasterCard ni h0…. to per kaha se load kar sakty hai,, direct kisi website se kar sakty hai? activation ky lia ya pahlay card ko activate karna zarori hai??? Ji activation zaruri hai use karnay say pehlay, aur private load ab khatam kar diey hain unhon nay aap kisi partner kay through transaction kar saktay hain. Add your card to your paypal account and after successful verification you will be able to withdraw money to payoneer card. @ Adanan. In payoneer site , It says visa load is for US based residents only. So how from pakistan we can load using visa card ? have u tried it. ? kya ap yaqeen karan ga ka mara pass ak saal ho gaya ha payoneer card ha lakin aj tak muja pata nahee chal saka ka isa load kasa karna ha. Kindly, muja e mail kar ka bata daan, ma ap ka bara sukarguzah hoon ga.
Ab private loads khatam kar diey inhon nay, aapko koi partner kay through transaction karni paregi. Yes Pasha, I have used two times, maybe they have restricted now. Better you should contact with them. @ Adnan , It says , Visa card load is for US residents only , So in Pakistan how cab we load our personal funds ? have u tried .. Yes, I have tried 2 times in Pakistan. Private loads are very limited, You must link your card to any of their partner to load funds. You may contact customer support. Bhai payoneer United States Postal Service (USPS) kay economy class kay through send karta hai card. 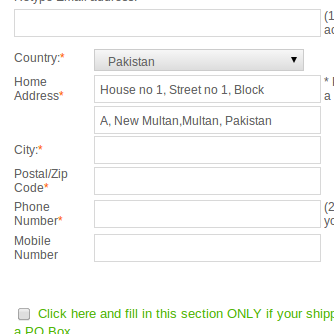 What do you mean by shipping address is not complete? Aap somevisits.com try karo is me achi earnin hoti he me bi 100$ ean kiya hen unho ne payout bhi ker diye hen lekin paypal account verified na hone ki wajah se me recieve nhe ker sakta. Bhai is cheez ka ziyada experience nae hai, agar aap freelancer hain to oDesk aur isi tarah ki bohat si sites hain jahan aap earning kar saktay hain, Jo paypal main payout kar deti hain. Aap http://www.payoneer.com/contactUs.aspx yahan ja kar unsay contact kar saktay hain, woh Online chat support bhi offer kartay hain. Address daikhnay kay liey aapko account main login hona parega, https://myaccount.payoneer.com/Login/Login.aspx yahan say aap login hokar apna address verify kar saktay hain. Payoneer card woh log USPS (United States Postal Service) kay through send kartay hain jab tak unko koi special instructions na di jaeyn (jiskay extra charges aap pay kareingay). Is mail main tracking ka option nae hai, Pakistan main aik say daidh maah main aajata hai usually, thora wait kar lijyiee agar nae aata to unko dubara contact kijyiega woh new mail kar deingay, unko report karnay say pehlay address dubara check kar lijyiega. yar adnan mujhay ye samjh nhi aa raha hai k us payment service kaisay activate karon ? koi website to hai nhi meray pass kya karon ? Ozem, Aap unko contact karain, woh behtar is mamlay main guide kareingay. How we get payoner card free online tell me.with short steps. You have to first sign-up with one of their partners (they have alot of partners working with them) some of them provide free Payoneer after registration. You just have to sign-up there and apply for new card. If you don’t have any partner site, you can directly apply through this method. You must have your valid CNIC or Passport or Driving license scanned while applying for card. I applied for a payoneer card couple of days ago but they declined my application. I’m quite surprised because I never heard from anyone about declined application from Payoneer. Anyone else whose application got rejected? Any idea about reason? I contacted the customer services but have not received a response yet. Yes, usually applications are not rejected. There maybe some reasons for rejection mentioned in rejection notice. You ‘ll get response soon, alternatively you may contact them using their online chat support. Assalam-o-Alaikum! Sbsey pehley to mein is blog k administrator / blogger Adnan sahab ko mubarak-baad paish krunga k unhon ny behtareen blog banaya hai or humari madad mein kosha’n hein. Uske bad mein shukria ada krunga k hr sawal ka unhon ny behtar or jald jawab dia. Uske baad mazeed shukria ada krunga k mujhe Payoneer sy mutallik itni detail sy btaya. Qk mein khud barra preshan tha k mian online work kr k bhi kis trah payout krunga pr yeh tareeqa behtar laga. Main jald apply krunga payoneer k lye. Koi masla ho to isi blogpost pr comments mein rujoo krunga. I will come and keep visitng this blog. Welcome always and keep visiting this blog. hello bro mai online earning kar raha hu lekin wo mujhay earning paypal kay zaray kartay hain kia mai paypal ke paisy kese tarha apne payneor card mai transfar kar sakta hu kese tareke say please mujhay btay mai preshan hu buhat. Yeh to us company per depend karta hai jis kay sath aap kaam kar rahay ho, Kiya naam hai company ka? 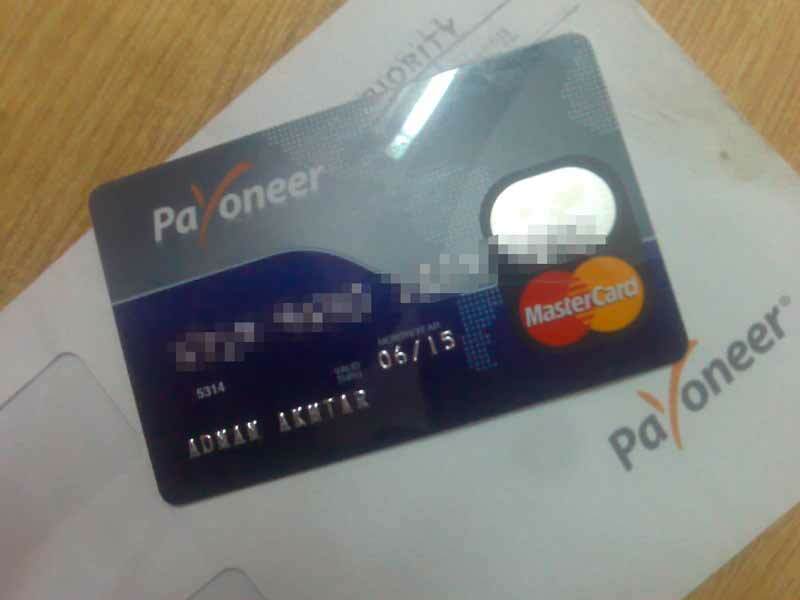 i just received Payoneer card, please tell me how to load money in it…. Ali, You can upload funds using your Master/VISA Debit/Credit Card or by linking your card with any of their partner. Salam! Thanks for great explanation. Could you please explain, how can I load money in my payoneer mastercard account myself? You can load money using your VISA/Master Card or by linking your card to any of their partner. Sorry about your question, Kiya aap mazeed clear kareingay aap kiya puchna chahtay hain? yar kisi ka pass payoneer card ha jo lahore johar town ma ya is ka pass rahta ho because mera card abi pakistan nahi aya or mera account ma 150 dollar ha ….koi bahi fees la la or kuch pasa nakal da …. jb delivery hogi card ki us time charge hogy? jb activate krway gy card ko us time kitne charge hogy? is main yearly charge kitne hoty hai? Kamran, Delivery kay waqt koi charges nae hotay, Card activate kartay waqt charges hotay hain jo her company kay mukhtalif hotay hain, Ziyada tar Pakistan kay liey about $30 hain. Yearly charges $30 hain agar aap kisi partner kay through aaply nae kartay warna her partner kay alag monthly charges hotay hain. Bro how can i enable Private Loads on my card ? i want to load card through Credit Card. Dear when call will be delivered to us, will they charge any amount to us? I am sure you are talking about payoneer card. No, they will charge when you will activate your card. can u tell me how we can load money in pakistan ?? in payoner card ? Through VISA/MasterCard which can be used over internet. thanks . you helped me understand everything . Doing online jobs and have applied for the card . Don’t worry aajaeyga, itna waqt lag jaata hai.